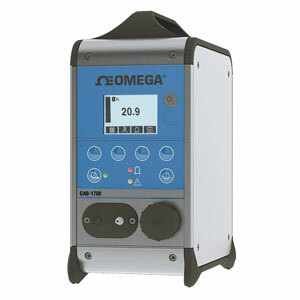 The OMEGA GAB-1700 oxygen analyzer has been specifically designed to meet the demanding needs of field and laboratory analysts, light industrial users and others who require fast, accurate and reliable analysis of common gas mixtures. This compact, portable and easy to use instrument is based upon a non-depleting, component specific measurement technique (magnetodynamic paramagnetic) for long life and minimal running costs, avoiding the problems associated with electrochemical or other less robust methods of analysis. Note: Though samples containing >5% CO2 are toxic they can be analyzed if suitable precautions are taken. Note: Comes complete with US power cord, UK power cord, EU power cord, universal power supply, RS232 cable, hand pump, 2 spare particulate filters, quick fit gas connector, moisture trap, Analyzer Test Sheet, and operator's manual. CE marked and in compliance with EEC EMC and WEEE Directives. 100 to 240V/43 to 70 Hz AC Power Supply is UL approved. Warning: These analyzers are not medical devices as defined in the Medical Devices Directive 93/42EEC and are not intended to be used on human beings for the diagnosis, prevention, monitoring, treatment or alleviation of disease, injury or replacement or modification of the anatomy. Calibration of the analyzer is recommended after each power up.